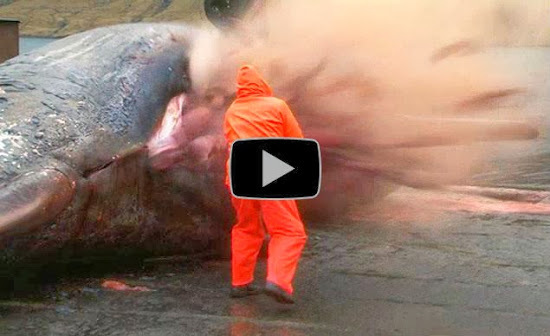 THIS is the disgusting moment a sperm whale exploded when a biologist tried to cut open its dead carcass. The fluorescent-orange clad expert looks tiny next to the huge beast, and begins by cutting at its side very gently. But clearly needing just the tiniest of gaps, the whale's insides explode out of its body like a volcano, showering poor Bjarni Mikkelse with guts. The sperm whale was one of two which died after becoming trapped in a narrow channel in the Faroe Islands in the North Atlantic. The island's 50,000-strong Danish community reportedly wanted to use the whale’s skeleton in a museum. But the 45ft carcass proved to be a bigger obstacle than anyone could have imagined, when gas trapped in its stomach caused the dramatic explosion on Tuesday afternoon. The footage has already racked up over 300,000 hits on YouTube, unsurprisingly putting a few people off their meals.